… it is good for a man to have a brother. Well, here comes another FMA vector from me (not that I apologize of it…). This project has been sleeping on my hard drive since March, and from time to time, I opened it, added some lines, and then closed Photoshop. 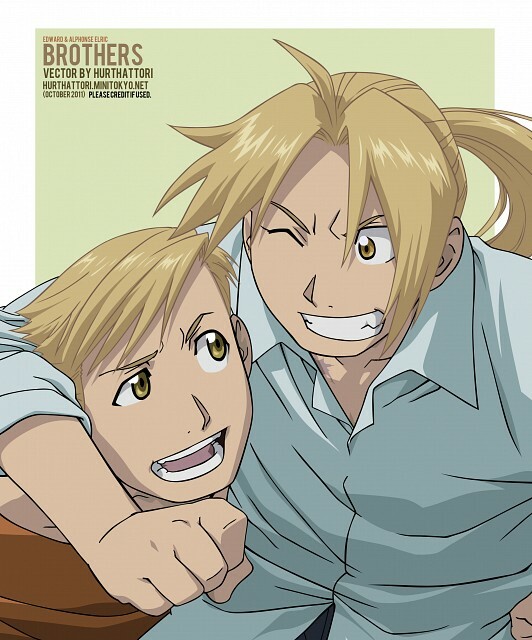 However, I recently rewatched both FMA series, and fell in love over again with the amazing story of Edward and Alphonse Elric. And with this feeling in my heart, I continued this vector. I felt inspired for the very first time in a long time. My desire to create things was revived. But this vector was also one of the most personal ones I’ve ever made. In each and every of them, I put a little something from me, even though my vectors are only copies of someone else artwork. But this one … While watching FMA, I felt that brotherly love is one of the strongest bonds you can have. However, no matter how much I admire the relationship between Ed and Al, I never wished to have a bond as strong as theirs with my siblings. The reason is that I’m already blessed with this kind of relationship. One of them may see this message, the other probably won’t but I hope they know that without them, my life would definitely be very different. It would be lonely, and there would be something missing in my own soul and heart, some kind of hole that would never be filled. I would never have been able to become the person I am if we hadn’t been together, walking every step of the road together. I was thinking about us while making this one. Thank you, both of you. NOTE : DO NOT upload elsewhere and claim it as your own work. Please credit if used, and send me a link to your work (either in my guestbook or by a private message); I would love to see what you did! Original scan : I can’t remember the exact place where I found the picture, but it is the cover of the “Fullmetal Alchemist official guide 4”, or something like that. The image was not high quality, but I liked the overall feeling of it. Extracted PNG : Available on demand. May be uploaded later, though. Total time : 10 hours and 30 minutes. Easier parts : It wasn’t a hard vector, so almost everything went smoothly. Besides, it was a whole lot of fun! Harder parts : Edward’s head. I enlarged the scan a bit, so the already blurry lines were somewhat harder to follow. I hope it looks good! Oh Hattorin! Nice to see one of your works again!